A concert of John Adams, Tchaikovsky and Dvořák had intriguing parallels. Finnish-born Osmo Vänskä, currently music director of the Minnesota Orchestra, guest conducted the San Francisco Symphony last weekend in a program that drew on folk themes and modal scales. The combination of late nineteenth century chestnuts and edgier modern work let us hear the cross pollination of the past in the fruit of the present. Adams composed Slonimsky’s Earbox in 1995 and it marked a turning point between his energetic minimalism and his recent operatic works, which rely more on counterpoint, layering and untraditional scales and their harmonies. Nicolas Slonimsky (1894-1995) was at the end of his extraordinarily long life when Adams met him. Conductor, composer, and witty author, his Thesaurus of Scales and Melodic Patterns influenced many jazz musicians and composers. Adams mined its pages for modal scales, giving his exuberant Earbox a touch of medieval flavor, and even a few whole tone phrases. Those early church scales showed up again in Tchaikovsky’s Piano Concerto No. 1, a work so well known that its lush orchestration and opening theme ride the edge of spoof. Once past the better-known regions, Tchaikovsky’s brilliance is again accessible. The powerful last movement heads for a fiercer sound, the archetypal folk melodies and modal scales of his Mother Russia. 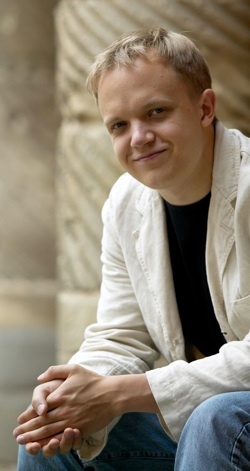 Finnish pianist Antti Siirala parsed breakers and waves of notes with an even roundness, choosing a cool sensuality over emotional extremes: neither sharp-edged pianistic brilliance nor schmaltzy sweep mar his middle ground, an emphatic vision of Russian passion and panoply. The Symphony shifted to simple and summery in the middle movement, piano following winds with deft and danceable lines, then thickened for the Allegro con fuoco. Hushed thunder of timpani gathered the tension, as folk motifs returned with sterner gravity. Tchaikovsky builds whole tone harmonies and bright modal scales to an exultant coda. A friend and protégé of Brahms, Dvořák chose a broader approach in his Symphony No. 7, inflecting his music with Bohemian Czech folk themes. Vänskä echoed the grand sweep of the music, conducting in a slow two rather than four, but sacrificed clarity for wider phrasing. His rounded direction, particularly in the Poco adagio, turned delicate orchestral muscle into flab. But they redeemed themselves in the lilting Scherzo. And the Finale, which opened with such dark power, blurred minor and major for a triumphant and scary finish. Simple and heartfelt, Dvorak’s themes had wide popular appeal, perhaps informed by his own humble roots. The No. 7 is one of his most tragic works, reflecting the recent death of his mother and perhaps the not-too-distant death of his oldest child. And yet he counters fortunes’ backhand with religious resignation and Slavic resolve. Later that week Vänskä and the SF Symphony teamed up with another world-class soloist: Oct. 28 and 30 at Davies Hall and Oct. 31 in Cupertino’s Flint Center violinist Vadim Repin joined them in Sibelius’ Violin Concerto, one of the great violin concertos of all time. Beethoven’s Symphony No. 8 and Coriolan Overture, and modern Finnish composer Aulis Sallinen completed the program. For details see www.sfsymphony.org or call 415-864-6000. This article originally appeared in the Piedmont Post. Photo: Finnish pianist Antti Siirala performed Tchaikovsky’s Piano Concerto No. 1 with the San Francisco Symphony.